Arrays of sub micron diameter polystyrene latex particles can be used as templates for the electrochemical deposition of macroporous metal films in which the metal contains arrays of uniform diameter interconnected spherical voids, the diameter of the voids being controlled by the choice of diameter of the polystyrene spheres used to assemble the template. 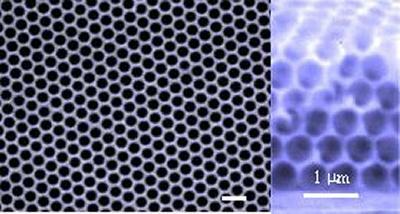 The resulting materials are examples of "metamaterials", that is materials whose physical properties are determined by their nanoscale structure. In collaboration with Professors Russell and Professor Baumberg in Cambridge, we are investigating the effects of this regular macroporous structure on the optical properties of these nanostructured metal films and their potential applications as substrates for Surface Enhanced Raman Spectroscopy. The strong surface enhancement on the structures makes them attractive for analytical applications and in collaboration with Professor Tom Brown we are investigating applications in DNA mutation analysis using combined electrochemical and SERS detection techniques.